David Gill Greenhouses offers temporary crop covers fixed to screw augers which are suitable for a range of uses including as temporary covers over seed and flower crops. 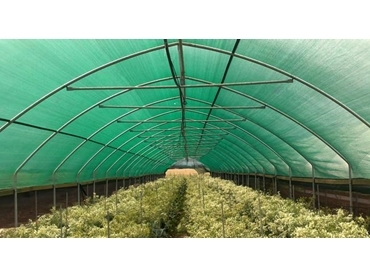 Measuring 6.5 metres wide, with post ranging from 1.5 to 2.4m high, these crop covers can also be installed for use as a crop support greenhouse for vegetables. They feature gothic shaped hoops with a 32mm gal pipe to prevent condensation and rain from accumulating, and are supplied ready to be fixed to specially designed augers that are screwed into the ground. This ensures the crop covers can easily be relocated in the future if soil contamination becomes a problem, or if relocation is necessary. These structures can be covered with shade cloth or celloclim plastic. Sides can be left open or fitted with insect screen or shade cloth, with roll-up curtains from solar woven or plastic film an alternative option. Aluminium gutter can be used to connect two or three bays wide.